So far we have a Home page, an About page, and we have a basic look and feel for this site. We've uploaded a logo, and we've changed the home page to use a default piece of content. As a next step, it would make sense to go ahead and add a Contact form so there can be feedback through the site. And as we can see from the mockup -- I'm going to go ahead and jump over to the mockup -- we have a contact link here and we also have a link for the contact form. Let's take a look at the mockup. I'm going to jump to the resource pack and I'm going to open up contact us with notes. Okay. So we see here we have a name input, an e-mail input, an experience level input here, comments, and a signup for this newsletter check box. All right. So this is our first form that we've created in Drupal, and as you'll learn as you begin to work with Drupal, there are a lot of ways to work with forms. There are modules that you can enable in order to add specific forms, and there's a module you can use to create your own sets of forms. You can even do some coding if you are enterprising enough, and add forms through code as well. What we're going to do is start as simple as possible and see if we can get what we need out of the simplest option. We'll find out that that's not enough, and we will move on to a more complex option. Okay. Go ahead and jump back to your browser. What we'll need to do here in order to create a contact form, a basic contact form, is to enable a module called "Contact. " So what I'm going to do is click on the modules link in the navigation, and this will give us a list of modules that are currently installed in our Drupal site, some of which are enabled, some of which are disabled. This modules page is pretty important. We're going to be coming back to it repeatedly through these videos, so let's take a moment to see how it's structured and what kind of information you can find on it. Let's start at the top. This first line here says you can download additional contributed modules to extend Drupal's functionality. 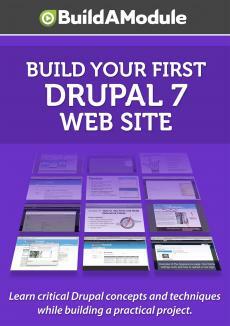 And if you click on this link, it will take to you Drupal. org, where you can see a list of modules available for installing and for extending Drupal.